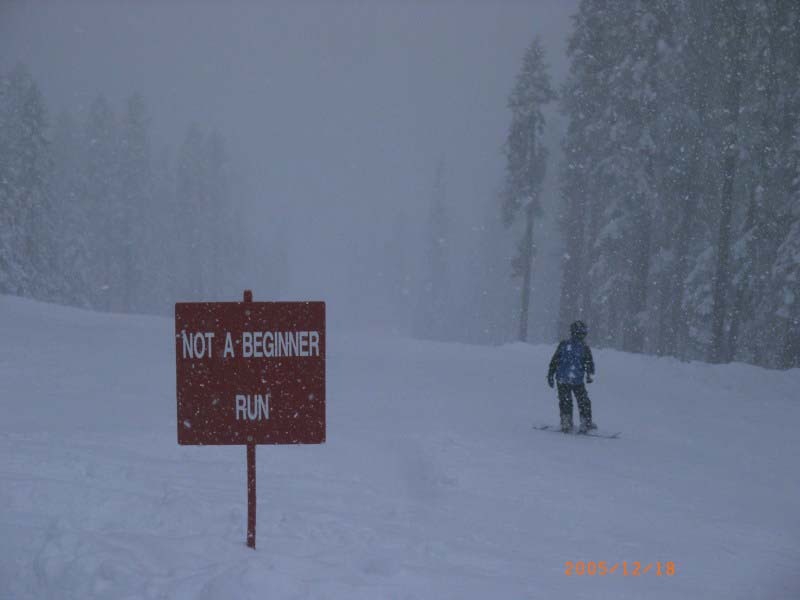 The Higher Education of Skiing and Snowboarding! Taking your skills beyond the next level! But most of all develop the feel for the Ride! The revolving ski deck teaching device has been around since the 1960's and initially was a tool for developing higher and new ski school techniques. It was first used to train world champion freestylers who dominated the sport and attributed their accomplishments to the revolving ski deck. However, these champions soon realized how the device could quickly instill the fundamentals in people who wanted to learn the sport of skiing and snowboarding. 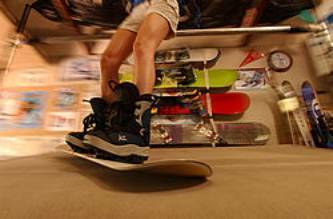 Since then, methods using the revolving ski decks have taught literally tens of thousands of people to ski and snowboard. By developing better instincts and habits of riding, everyone from beginners to pros have furthered their enjoyment of the sport. The revolving ski decks can be made to change from green run conditions to a double black situation covering the whole challenging range for any skier or boarder. 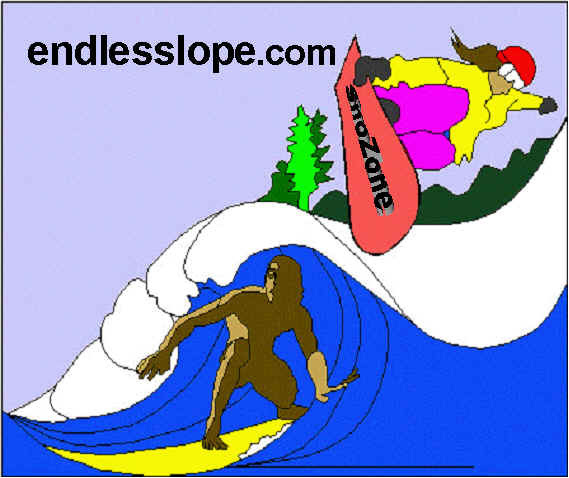 SnoZone Endless Slope Ski and snowboard school (SZ) opened it's doors in the winter of 1998 in Sacramento, California and followed with a second school in San Francisco in the winter of 2003. The Sacramento school expanded to a new location in the winter of 2008. At Snozone, students receive individual attention through lessons that are geared towards each student's needs and goals. The lessons are all about the student's abilities as each movement of the student is analyzed and corrected, instilling the proper positioning and reactions to riding. The students view themselves in a mirror studying each movement. Most importantly, they feel the ride and understand the difference between the correct efficient movements versus difficult and unsafe ones. Everything is transferable to the snow. In our dry land surf simulator classes we approach a similar process where beginner surfers develop surfing-specific balance skills on a simulator board creating appropriate reaction to lateral surfboard movements. This is followed up with an ocean class where they test their development riding a real surf. Go places you haven't gone before! Why Riding requires the proper education! Riding requires the development of specific balance muscles, sensory perception and reactions that are different from walking and running. Often, many riding reactions are opposite to those of walking. We are familiar with walking and running and depend upon our moving legs to capture our balance with each step. However, when it comes to riding, we become uneasy, uncomfortable, and unsure of our balance with our feet planted on a platform or two, such as a snowboard or skis. To do well at sports such as skiing, snowboarding, or surfing requires awareness, reactions and behavior that are mainly foreign because we do not require them in our daily life. 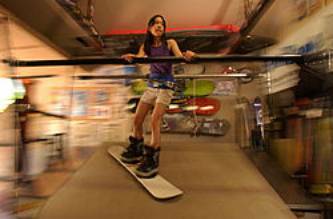 This is where SnoZone Endless Slope can acquaint your body with the ability to balance and efficiently control a ride! 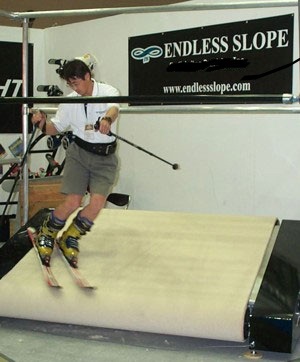 Providing you with simulators that develop your skills to ride skis, snowboards and surfboards, the SnoZone Endless Slope program does more than teach: it trains your body to react and behave as a rider. Our primary goal is not to teach you technical aspects of skiing, snowboarding or surfing but to train you to become a skier, snowboarder or surfer. Teaching you the technical aspects of these sports is only academic if you cannot perform them. We enable our students to become skiers, snowboarders and surfers so that they can implement the technical aspects of these sports. You will actually feel the difference in these sports because doing well in these sports first requires feeling the ride. Because we are converting a student into a rider, our school is a higher educational form of teaching. For the advanced skier and snowboarder we are equivalent of a graduate study establishing in them a precise working technical capability and understanding. We are the final stage of education that prepares one for the real snow or water world.